Jo Labanyi is professor of spanish and a director of king Juan Carlos 1 of spain centre at New York university ,she founded the journal of Spanish culture .This is one of the OUP series of very short introduction ,I requested a copy from OUP ,as I thought it would give me some guidance and back ground information on Don Quixote and its writer Cervantes and also where to carry on my reading in Spanish literature ,The book is divide in to numerous chapters under 4 main headings ,multilingualism and porous borders ,spanish literature and modernity ,gender and sexuality and culture patrimony .the first section deals with the moorish influence on the literature on spain,via epic poems like el Cid ,the rise Alfonso in the 13th century and his influence on the written word ,french ,jews influences .WE also find out about the post Franco rise of works in the various spanish languages ,such as Manuel Riva’s in Galician ,Basque with Bernardo Atxaga and Carmel Riera in Catalan ,under Franco these languages were suppressed . 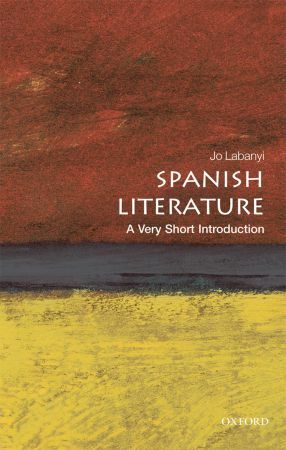 The second section deals with how spanish literature has fared through time ,been influenced and shaped by its writers and external writers .Also in places lead literature but was forgotten and other novels held up as the first . Getrudis Gomez De Avellaneda “sab” (1841) ,the first spanish language anti-slavery novel , anticipates uncle tom’s cabin by ten years . There is a focus on the 1920’s surrealism and writers of the time such as Federico Garcia Lorca .through to the new wave of spanish writers such as Zafon and Perez-Reverte ,the generation X influenced books of Ray Lorca . The last two short sections deal firstly with female spanish writers ,Homosexual writings a focus on Monique Lange and her husband and probably the best Spanish writer in the 20th century Juan Goytisolo .the last section deals how Spain has dealt with its writing heritage and its history ,its reverence of Cervantes and his masterpiece Don Quixote . I found this book a wonderful insight into spanish literature and gave me loads of background information on the writers and the history ,I certainly via this book have many years of Spanish literature to enjoy ,from Miguel De Unamo ,via Juan Goytisolo ,Lorca and the new spanish voice in america Ray Loriga ,Molina . HAVE YOU READ ANY FROM THIS SERIES ? DO YOU HAVE A FAVOURITE BOOK FROM SPANISH ? This looks really helpful! I know next to nothing about Spanish lit and the only stuff I’ve really read is some poetry. I’m trying to read more “foreign” literature and this looks like a great intro to Spanish lit! Is this the first intro to Spanish lit. you’ve read? Oh, I should look for more of these sort of books. Sounds like a great way to find inspiration on what to read next. I like the small size of ‘A Very Short Introduction’ series. Very cute and handy and with nice flaps. I’ve read only one in the series, on Quantum Theory. Section 3 obviously interests me the most 🙂 sounds like a great book and I’m glad you enjoyed it. This does look like a great book if you are looking to be introduced to Spanish writers. I should definitely try. My surname was Spanish and my ancestors came to America sometime around 1600 my dad tells me. I was going to maybe start with Zafon. Is he a good writer to start with for Spanish writers? Thanks for the find. I’m going to get that at the library. While I’m often writing about modern Spanish writers, I don’t know too much about those from the past. This should help with a brief grounding and help me pick some to read.